The anticyclone over Rajasthan and adjoining regions has all but dis-integrated the seasonal low, and with a vengence, is all set to "wipe it off" from the Western region by Friday. The seasonal low, if we can now call it so, over the Rajasthan region is 1004 mb, and soon will be a huge region of "high" at 1010 mb. Favourable conditions will withdraw SWM out of Rajasthan, Haryana, Kashmir, Delhi, HP, Utteranchal and West UP by Wednesday 26th. The axis moves towards Northern Maharashtra by Thursday, 27th/Friday 28th, and the SWM is all set to call it a "season" from Gujarat, MP and UP by Friday 28th. Resultantly, once the above scenario takes shape, the Westerlies winds in the NW and Northern India will become N/NW, and will cover all of Northern and Central India, down South upto the Vidharbha region. These Northerly winds, will change direction South of the Monsoon axis over Maharashtra. For convienance, I'll call this region "Region A", where the North winds cease and line of dis-continuity starts, and where the axis will be located. Now, South of this, the axis line diverts the wind, and in the State of Karnataka, a line of wind dis-continuity can form, creating turbulent weather. Please note, that this "Region A" may occur slightly North or South of Vidharbha, cannot be too sure today. 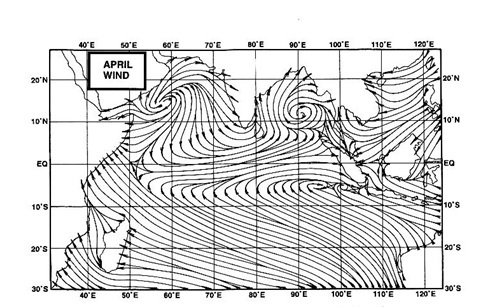 As the anticyclone grips the Northern and Central States, the winds go "haywire" and turn a drastic Northerly in Northern and Central India upto Vidarbha. Thundershowers will be trying to "pop up" in Maharashtra on Wed 26th/Thursday 27th/Friday 28th/Saturday 29th, as the monsoon current weakens fast over the state. A sticky local mini vortex aloft brings some rains to Saurashtra and Eastern Gujarat Tuesday 25th/Wednesday 26th. A weak Low forms in the Bay on Wednesday 26th, and rapidly moves into Jharkhand/W.Bengal (Heavy rains). Mumbai: For many of Vagaries' Mumbai readers, it will be a short lived monsoon farewell (compared to what we have seen last few years). Two or Three thunderstorms at the most, between Wednesday and Sunday. SWM retreat will be somewhat "stuck" for some time after retreating upto Karnataka. Immiedietly, on the withdrawal line reaching coastal Karnataka, the shortened "pigmy" off shore trough strengthens, and the strong "diverted " inland winds may give rise to an UAC/Low off the Karnataka Coast by Saturday 29th, and heavy rains likely in coastal Karnataka Saturday 29th/Sunday 30th. (Again, since this is a long term estimate, the UAC/Low may form a bit North or South). Thats not all ! The rainfall moves eastwards into Karnataka, and even Bangalore can expect heavy rains for a couple of days early next week. So, the SWM will not move away from the Southern Indian Peninsula till mid week next, at least. Presuming it retreats after the 5th of October, NEM can be, in calculable probibilities, NEM can start its advance between 16th October and 20th October...as of the situation today. btw, IMD annonced Monsoon withdrawal from extreme west Rajasthan and Kashmir....on 24th, as hinted by vagaries a few days ago..
@rajesh today it was very very hot at panvel ,,the day was like a typical may day,,woth hot partly cloudy nd humid weather( relative humidity dropped to 46% at 2 pm). The heat index was very high today.i am getting a gut feeling tht the monsoon wont sustain in our area till 1 st oct,,it may retreat by 1 st oct itself!!! Do u thnk we ll get the promised departing thudershowers,,it luks the conditions r not favourable for thm! earlier a few days ago when i mentioned swm will be in a hurry, abhijit was shocked, and wrote" by 25th?" well abhijit, if not 25th, certainly by end of this month..
your question regarding mumbai?is it ,that northeast monsoon is going bring some rain in mumbai too. well it will be great thing atleast will escape the october heat. @ Rajesh Sir. Will definitely read tonite article. Back to Badlapur today after Ganesh Festival celebration in Pune. Very dissapointed as no Thunderstorm event occur neither in Pune , Badlapur & Mumbai belt from 20 Sept till today atleast !! Still having hopes of Thunderstorm around 26/27 Sept.. Last 2 days observed chilly morning & cool night with clear skies and patchy white cloudy with haze for the day time with afternoon bit hot for Pune . And Badlapur had sky turning black in later afternoon but dispersing quickly then morning turning very foggy and remaining day hazy with patchy clouds around. CRASH in the daily figure of rainfall reported for yesterday(ending 8.30am today)!! Only 2.2 mm against an average of 5.5mm. Our target of 845mm is looking a bit shaky !! After a partly cloudy sky and hot day a clrar and pleasent eve hope october heat has started feeling it as " shayad toofan ke pehale ka sannata hai". @pavan btw wat do u do? ?i am pursuing biotechnolgy engineering ,,so i have microbiology as a subject!! Badlapur too cool at moment with temp 25 C outside. As skies are very clear so might be tomorrow early morning min temp may fall further around to 22 C here. already misty conditions outside clear signs of winter setting in early . here at bhoisar. Monsoon has all but retreated from Kathmandu. Unlike last year, there were no major thunderstorms to bid farewell to monsoon. The expected drop in temperature has started with this morning's low at 17.5 degrees C. The lows in western town of Dadeldhura is 15 C, that at Jumla is 10 C and at Jomsom is 9.5 C signalling the eastward movement of cooler temperatures in Nepal. One of the lowest readings of the monsoon recorded this season yesterday (ending 8.30am today) of 1.5 mm !!!!! The all India deficit is at 6%. Even a target of 835mm for the entire season now looking uncertain. The mysterious "NO - GO" zone between 833.7mm and 859.8 mm (according to IMD data) for the past 111 years is likely to remain unfilled this year too if the monsoon behaves like it has been in the last two days. For those interested -- this zone between 834 and 860 encompasses 853 which is the "Golden Mean" between 1100mm (maximum rainfall in the past 111 years) and 700mm (minimum rainfall in the past 111 years). The "Golden Mean" or ratio is found in quite a few of nature's phenomena including my own field - the stock market. 0.618 or 1.618 are "Golden Mean" multipliers..
Now 1124 + 697 = 1821 * (0.618) = 1125 !!!!!!! and 1124 - 697 = 427 * (1.618) = 691 !!!!!!!! The figure 691 is close to 697 whereas 1125 is almost same as the high. GSB: Dont come to conclusion so fast...this is weather. We have some very good rainfall coming from the Southern Peninsula (Karnataka) by late end of the Month..maybe just slipping into October...final figure may vary from your current thinking..
SSET: Hope my estimate for B'Lore brings some cheer to you ..
anonymous: Thane ,same estimate as Mumbai. 2/3 thundershowers between Wednesday and Sunday..
this differs from the "Golden Mean" by an teeny weeny 0.0053745 or in other words it is 99.67% on the mark !!!!! Rajesh sir, I know you are absolutely correct !! I am just letting my mind run. When I see these things I just can't do anything but do some calculations !!!!!! I hope you don't mind !! Rajesh sir, I urge you to study the "Golden Ratio". I have been using it for the past almost 15 years. It is useful mathematical tool to learn..
GSB: What do you think? The low ,will it form in the Arabian Sea off Karnataka as mentioned by me..i had said by Sat/Sun in that region..and Karnataka gets heavy rain. That kind of question you can ask me probably in the year 2014 .. I'll be better able to answer you then I think.. Anyway, dont think i would be wrong...at least prediction of low in the Bay for 26th seems to be on schedule. Thats the forecast made by vagaries on 23rd..dont think there was a similar estimate elsewhere..
nor do i see the arabian sea forecast anywhere as yet ?? Rajesh Sir - I still can't believe - day 25 sept hot - NO RAIN. satellite picture shows no clouds??? All are far far away from annual rain of 800mm. Pavanji can you send any good bacterias to Bangalore - city garbage is making us sick. @ Rajesh Sir. Yes, you are correct Sir. Till Friday thunderstorm at isolated places on west coast then off shore getting strong off Karnataka coast from Friday night onwards.So Coastal Karnataka & up-to some extent Goa and southern Konkan tip also benefiting from it with rains on weekend there. Not sure but can that off shore rains can reach up-to Mumbai !! Abhijit: Difficult to move above coastal Karnataka, as UAC will form and move east into interior Karnataka. This will happen due to line of wind dis-continuity in southern peninsula..mentioned in blog yesterday. We, in our region here,(and all over Mah and Central India) will notice this change mentioned in blog when we notice the winds in our region suddenly turning abs North, and dry. i feel sset is the only bacteria in bangalore plz leave the city .and dont come back here again.